Bonnier AB (Swedish pronunciation: [ˈbʊnˈniːr]; also the Bonnier Group) is a privately held Swedish media group of 175 companies operating in 15 countries. It is controlled by the Bonnier family. 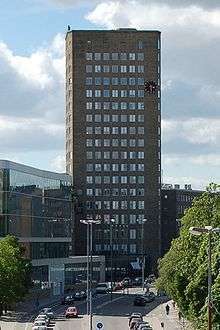 The company was started in 1804 by Gerhard Bonnier in Copenhagen, Denmark, when Bonnier published his first book, Underfulde og sandfærdige kriminalhistorier. Gerhard's sons later moved to Sweden. The Bonnier book publishing companies in Sweden that are part of book publishing house Bonnierförlagen now include Albert Bonniers förlag, Wahlström & Widstrand, Forum, and Bonnier Carlsen, as well as other book publishers and imprints in Sweden. Bonnier Tidskrifter publishes magazines, including Veckans Affärer, Damernas Värld, Amelia, Sköna Hem, Teknikens Värld, Resume, nearly a dozen crossword magazines, and the tablet magazine C Mode. Other subsidiaries include Sweden's commercial TV network TV4 and C More Entertainment; movie theater chain SF Bio (40 percent share) and film production companies Svensk Filmindustri and Sonet Film; daily newspapers Dagens Nyheter, Expressen, Sydsvenskan and Helsingborgs Dagblad; business daily Dagens Industri; and medical journal Dagens Medicin. In Denmark, operations include magazine publisher Bonnier Publications, which has subsidiaries in Norway, Finland and Sweden; business daily Dagbladet Børsen; and film distributors SF Film and film producers SF Film Production. Finnish operations include MTV Media Oy, which owns commercial channels MTV3 and Sub, among others; book publishers Tammi and WSOY; plus magazines from Bonnier Publications and film productions by FS Film. In Germany, Bonnier Media Deutschland includes Ullstein Buchverlage, Piper Verlag, Thienemann Verlag and Carlsen Verlag, among others. In Norway, along with magazines from Bonnier Media and the movie chain SF Kino and film distribution company SF Norge, subsidiaries include book publisher Cappelen Damm. In January 2007 the Bonnier Magazine Group acquired 18 magazines from Time Inc. As a result, in the U.S., the Group owns over 40 magazines, including Popular Science, Saveur, Field & Stream, Outdoor Life and Popular Photography, a range of action sport magazines focused on motorcycling, as well as a number of niche travel and lifestyle titles. Book publisher Weldon Owen is also part of the company. Bonnier Publishing book publishing operations in the UK include Autumn Publishing, Hot Key Books, Red Lemon Press, Templar Publishing, Piccadilly Press and Weldon Owen (which is separate from the U.S. book publisher); Piccolia in France; and Five Mile Press in Australia. Bonnier Publishing USA was formed in August 2016, composed of the publisher Weldon Owen and the children's publisher, Little Bee. The president of Little Bee, Shimul Tolia has become the CEO of this group. Bonnier owns business newspapers in Estonia (Äripäev), Lithuania (Verslo žinios), Poland (Puls Biznesu) and Slovenia (Finance Business Daily), as well as medical journals in Denmark, Norway, Finland, Poland, and Slovenia. Bonnier is also behind several digital startups, including the tablet publishing platform Mag+ and children's toy app producer, Toca Boca. Bonnier is controlled by around 75 family members, including some seventh-generation heirs. In January 2007, the Bonnier Magazine Group agreed to acquire 18 magazines that Time Inc. was divesting. The estimated price was US$225 million in cash and the assumption of about US$42 million in unfulfilled subscription liabilities (subscriptions already paid but not yet delivered.) The magazines in the package employed 550 people and included Outdoor Life, Popular Science, Field & Stream, Ski, Yachting, and Transworld Snowboarding, as well as 11 other titles that were part of Time Inc.'s Time4 Media Group. Also included were Parenting, and Babytalk, which were part of the Parenting Group. That price was believed to be a multiple of about 11 times cash flow for a group that had net income of around US$20 million and revenue of around $230 million. ↑ "Board of Directors". Bonnier AB. Retrieved 2 January 2012. ↑ "Top Management". Bonnier AB. Retrieved 2 January 2012. ↑ "Bonnier AB". InsideView. Retrieved 24 January 2014. ↑ "Global Publishing Leaders 2012: Bonnier". Publishers Weekly. Retrieved 14 November 2012. ↑ "Bonnier AB". Linkedin. Retrieved 24 January 2014. ↑ "Bonnier Korsord – Om oss." Krysset.se. Retrieved 4 January 2012. ↑ "Tidningsaffären ingen heroisk investering". Svenska Dagbladet. Retrieved 27 April 2014. 1 2 "Bonnier Magazine Group Buys 18 Magazines from Time Inc.". TimeWarner. New York, NY. 25 January 2007. Retrieved 28 February 2015. ↑ "Bonnier Magazine Group publishes more than 150 magazines in seven countries.". Retrieved 24 January 2014. ↑ "Templar Publishing Buys Piccadilly Press". Publishers Weekly. 1 February 2014. Retrieved 12 February 2014. ↑ Millot, Jim. "Bonnier Publishing Plans $100 Million U.S. Book Division". Publisher Weekly. ↑ Kelly, Keith J. (26 January 2007). "Bonnier Coughed Up $225M to Time". New York Post. Retrieved 31 December 2011.